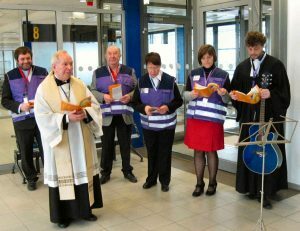 Caring for passengers, airport employees, visitors and other persons is what the Berlin Ecumenical Airport Chaplaincy does. Employees at the airport and travelers are offered confidential conversations and a brief business interruption. There is always something going on at the Berlin Airports. The two airports Berlin-Schoenefeld (SXF) and Berlin-Tegel (TXL) are the modern city gates of the German capital. Some take off to distant cities and countries, while others arrive or change planes here. They meet each other ON the background of their different stories, tell of their hopes or of their disappointments. 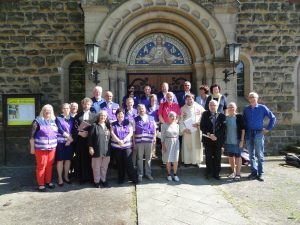 The Ecumenical Airport Chaplaincy in Berlin is an institution of the Protestant and Catholic Church; is open to all, regardless of religion or belief. The Airport Chaplaincy seeks proximity to the employees at the airport, has an open ear for them, and appreciates the value of their work. In doing so, the pastoral duty of confidentiality is observed. The Airport Chaplaincy has time for passengers, guests and visitors. It provides support in emergencies. The Airport Chaplaincy is at everyone’s disposal with prayer and blessing. At the Berlin Airports, Pastor Justus Münster and Father Wolfgang Felber SJ are on the way with a team of volunteers to make a “stopover” for the soul possible. Services for Christian travel groups or giving a blessing for travelers are also possible.